A spectacular weekend of fun for families, aviators and enthusiasts of Aircraft and Machinery. Held every year on the last weekend in May, this is an event not to be missed! The Old Station Flying Club has staged this unique and very popular fly-in event since 1989. Open to all members of the public, this weekend-long show includes fun events such as tractor pulling, truck shows, and 'Joy-Flights'. 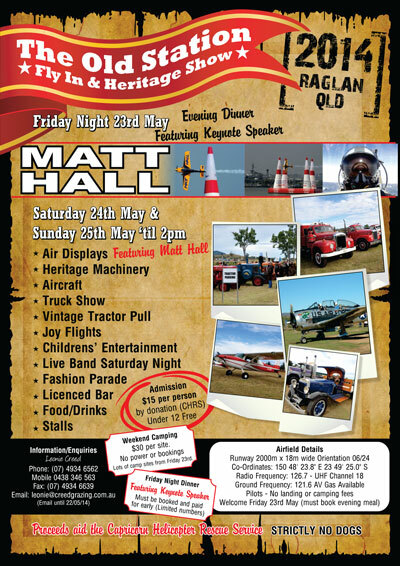 The Old Station Fly-In and Heritage Show welcomes pilots and their aircraft from all over Australia and the world to 'fly-in' and join the fun for this annual extravaganza. A wide range of vintage machinery, trucks and tractors are on display, as well as helicopters and aircraft. Great Saturday Night Entertainment - full bar facilities, live music, bonfires and great hospitality. 'The Old Station' offers camping facilities for Friday and Saturday nights, with full toilet and shower facilities provided. All proceeds from the weekend are donated to charity. For many years Creed Grazing Co. has supported the Capricorn Helicoptor Rescue Service. Ground Frequency: 121.6 AV Gas available. Pilots - No landing or camping fees. Childrens' Entertainment - Lots of prizes to win!